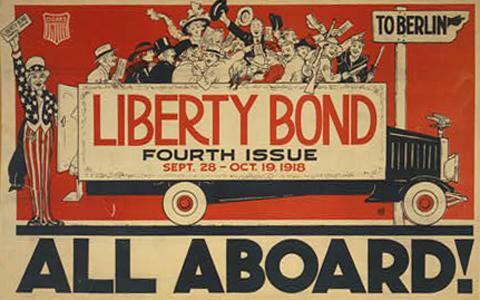 A poster for selling liberty bonds shows Uncle Sam with a truck full of citizens holding bonds under a sign saying "To Berlin"
LARRY WEST: Nineteen eighteen was the final year of the most terrible war the world had ever known. But World War One did not end quickly or easily. The German Army made a final effort to defeat the Allies. The United States had entered the conflict. And Germany wanted a victory before large numbers of American troops could get to Europe. Germany's effort became easier after it signed a peace treaty with the new Bolshevik government in Russia. The treaty made it possible for Germany to use all its forces against the Allies on its western border. In the end, however, Germany's plan failed. 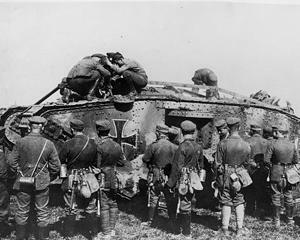 Allied troops pushed back the German attack in a series of bloody battles. The addition of American soldiers greatly increased Allied strength. MAURICE JOYCE: The leader of American forces in Europe was General John J. Pershing. General Pershing used a weapon new to the world of war: air power. Airplanes were used first simply as 'eyes in the sky'. They discovered enemy positions so ground artillery could fire at them. Then they were used as fighter planes. They carried guns to shoot down other planes. Finally, planes were built big enough to carry bombs. General Pershing also used another new weapon of war: tanks. He put these inventions together for his battle plan against Germany. LARRY WEST: Pershing's target was the Argonne Forest. It was a tree-covered area Germany had held since nineteen fourteen. The forest was protected by barbed wire and by defensive positions built of steel and concrete. It was the strongest part of the German line. It also was the most important part. If Argonne fell, Germany's final lines of defense would fall. The fighting in the Argonne Forest was fierce. Thousands of men died. Sometimes, troops got lost because the forest was so thick with trees. But day by day, the Allies pushed the Germans back. MAURICE JOYCE: Germany's leaders were losing hope. 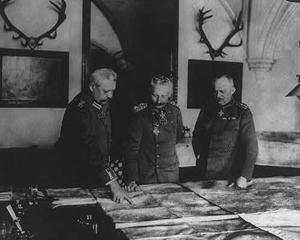 In September, nineteen eighteen, they met with German ruler Kaiser Wilhelm. The army chief reported that the war was lost. Germany had no choice, he said. It must give back all the territory it had seized and try to negotiate a peace agreement. Other officials told the Kaiser that the situation at home was bad, too. People were starving. Revolutionaries were plotting to overthrow the government. Kaiser Wilhelm agreed it might be best to seek peace now. . . Before Germany was destroyed completely. He asked his foreign secretary to send a secret message to American President Woodrow Wilson. The message would propose immediate negotiations to end the war. LARRY WEST: President Wilson received it. He did not tell the other Allied leaders. Instead, he returned a message to Germany. Wilson asked if Germany was willing to accept the peace proposals he had offered many months earlier. Germany's Chancellor answered that his government did accept the proposals. However, the events of war ended the secret exchange of messages between Germany and the United States. German submarines had increased attacks on Allied shipping. Two passenger ships were sunk. Eight hundred twenty persons were killed. Many were women and children. President Wilson was shocked. He told Germany there could be no peace negotiations with such an inhuman enemy. MAURICE JOYCE: In late October, nineteen eighteen, Wilson sent a final message to Germany. He wanted a settlement that would make it impossible for Germany to fight again. Germany, Wilson said, must promise to withdraw its forces from all Allied territory. It also must close its weapons factories. 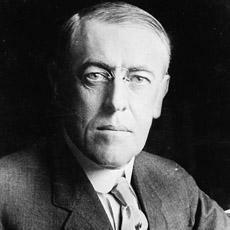 Wilson added that the Allies would negotiate only with a government that truly represented the people of Germany. . . not with military rulers. The new German Chancellor was Maximilian, Prince of Baden. Prince Max received President Wilson's message. He succeeded in getting Kaiser Wilhelm to dismiss the man responsible for German military policy. But he failed to get the Kaiser himself to give up power. LARRY WEST: Not all allied leaders supported President Wilson's plan to end World War One. They could not agree on some parts of it. Britain, for example, opposed the part about freedom of the seas. Britain said it would prevent the kind of naval blockade which had been so effective against Germany. France and Italy opposed the part about creating a new international organization. Wilson had called it a league of nations. To solve these differences, Wilson sent his closest adviser to Europe to meet with Allied leaders. The discussions were long and sometimes bitter. Many of the Allies thought Wilson was being too kind to the defeated enemy. But in the end, they all agreed to accept the plan as a starting point for peace talks. MAURICE JOYCE: By this time, in early November, the situation in Germany was growing worse. Communists and Socialists were calling for a rebellion. 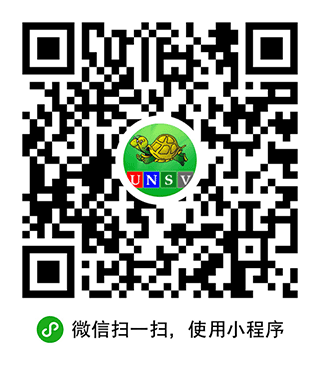 The navy was ordered to go to sea. Sailors refused, and killed some officers. Reports told of rebellion in parts of the German army, too. The nation's leaders had no choice. They would negotiate a peace treaty. On the morning of November eighth, a German delegation went to Allied military headquarters to discuss terms. LARRY WEST: The Germans were met by the Supreme Allied Commander, Marshal Ferdinand Foch of France. Foch greeted them coldly. And he did not offer peace terms until they officially asked for a ceasefire. Germany -- not the Allies -- had to put down its weapons first. The Germans were shocked when they heard the terms. The list was severe. Among other things, Germany must withdraw its forces from all occupied territories. It must give up Alsace-Lorraine, a part of France it had held for almost fifty years. It must give up most of its weapons including airplanes, submarines, and battleships. And it must turn over large numbers of trucks, railroad engines, and other supplies. MAURICE JOYCE: The German delegation said it could not sign such an agreement. Germany, it said, was not surrendering. It was only asking for a ceasefire. The delegation said it could not accept the peace terms without communicating with the government in Berlin. But the German government was falling apart. Kaiser Wilhelm had finally resigned and left the country. A new cabinet had been formed. And a new prime minister had declared a German republic. Yet the situation remained unsettled. Because of this, the German delegation negotiating with the Allies had to decide for itself. After much argument, the men agreed to the Allied terms. They signed the peace treaty. A ceasefire began a few hours later. LARRY WEST: News that the shooting had stopped set off wild celebrations throughout the world. People danced in the streets. They cheered the end of the worst war in history. There were celebrations along the battle lines, too. But these were quiet. Soldiers from both sides climbed out of long trenches dug in the ground. They met the men who, a short while earlier, had been their deadly enemy. The bloody European conflict was over. The dispute, however, was not. Another fierce battle was ready to begin. This time, the battle would be among diplomats. The fight over the peace treaty officially ending World War One was about to begin. the dispute,however,was not.another fierce battle was ready to begin.this time,the battle would be among diplomats.the fight over the peace treaty officilly ending world war one was about to begin.